Not many of us have the luxury of going to a top art school and learning how to draw and paint in person. If you are like me and do not have this luxury, then you have the added challenge of being a self taught artist (as if learning art was not hard enough). There is nothing glamorous about being a self taught artist. In a perfect world, I would love to be taught by some of the great masters of drawing and painting at a top school. On the flip side however, I would prefer to be a self taught artist over going to an art school which does not teach art as if it were a trainable skill. As a self taught artist, you will have a tough but rewarding road ahead. You will not have the structure or guidance provided by a top art school, however you will have freedom to learn how you please. If you are disciplined, then you can achieve anything as a self taught artist that a trained artist could achieve. In fact, formal art training can be restrictive to the learning of some artists, who may be better suited to the self taught path. Albert Dorne - mostly self taught. Vincent van Gogh - studied art briefly at the Antwerp Academy, but this had little influence on his approach to painting. Paul Gauguin - was a sailor and stockbroker before he began painting. Charles M. Russell - no training at all. James McNeill Whistler - mostly self taught. 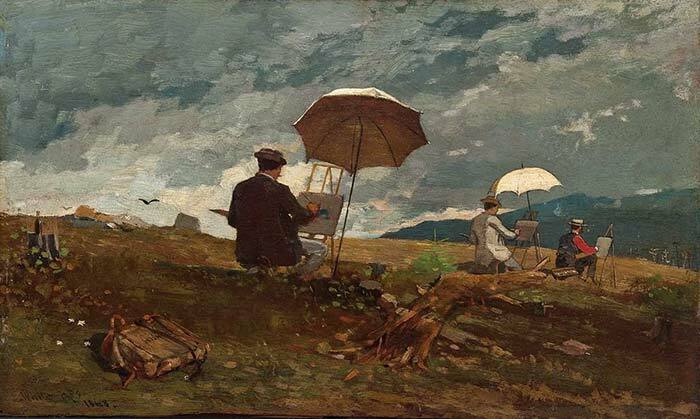 Winslow Homer - no formal art training. 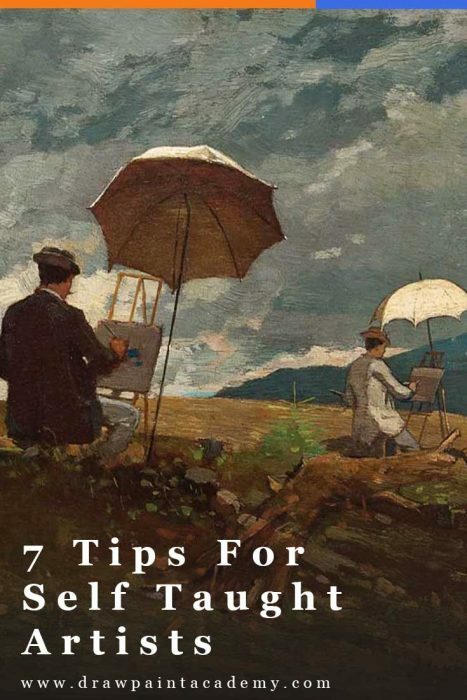 So if you are on the self taught journey as an artist, here are 7 tips to help you. It can be easy to put on rose-colored glasses when viewing your own work. But in order to actually learn and improve, you need to learn how to judge your art in an unbiased and critical manner. If on the other hand you are your own biggest fan, you will never identify any weaknesses or areas to improve on. If you feel your ego is getting in the way of your learning, then put yourself out there and submit your work to competitions and galleries. You may be quickly humbled. If you expect too much as a self taught artist then you will quickly be discouraged if it doesn’t go your way. Being an artist is hard enough as it is even with formal training. However, it is also important that you have an almost unbound optimism. You should be aiming to achieve whatever you desire. This is what drives you forward. You may not achieve everything. In fact, you should certainly not achieve everything you desired. If you have, then you probably did not dream big enough. Sometimes the best way to study the techniques and processes of the great masters is to just try and copy their works. This will give you a better understanding of the problems they faced, the strokes they made, the colors they selected and their overall approach to art. The objective with copying master artworks is not to try and replicate them, but rather to get a feel for how the artist worked. This should only form a small part of your studies though, as it is important you develop your own style. If you want to be a successful self taught artist, then it is important that you simply put the hours in. Unfortunately, this is the hardest part about being self taught. Most of you will have day jobs and other hobbies. You do not have the luxury of studying for 7 hours a day at art school. So you need to find time when you can. Optimally, you should have regular sessions throughout the week. These do not need to be long sessions, but they should be focused and dedicated. You need to seclude yourself from the world and make those sessions count. Put on some music and tune out the rest of the world. Half an hour of solid practice is much more effective than 7 hours of wavered practice. A common pitfall for self taught artists is waiting for that perfect time to practice (which as you will find never comes). You will just need to make do sometimes. One of the best changes I made was to incorporate small paintings into my training and aim to complete them in just one session. This is the complete opposite to spending weeks trying to finish a huge studio piece, which often will just end up being unfinished in storage. Small and quick paintings will keep your inspiration fresh and will make sure you do not get bogged down on a larger piece. A great book which is based on this idea is Daily Painting: Paint Small and Often To Become a More Creative, Productive, and Successful Artist. A recommended read for all artists. When you are not surrounded with other studying artists, you may find that you end up comparing yourself to very established professional artists (generally those who you discover on the internet). What you need to realize is that all professional artists were amateurs at one stage. Look at the professionals for inspiration, but do not compare yourself to them. Only focus on yourself and how you can improve. That is all that matters. I am a firm believer that you should document everything you do, even when you are in the early stages. There may be a time when your early works will be very significant to you. When you observe your artworks as a collective group, you may be able to identify any areas of weakness that you may not have been able to identify from an individual piece. 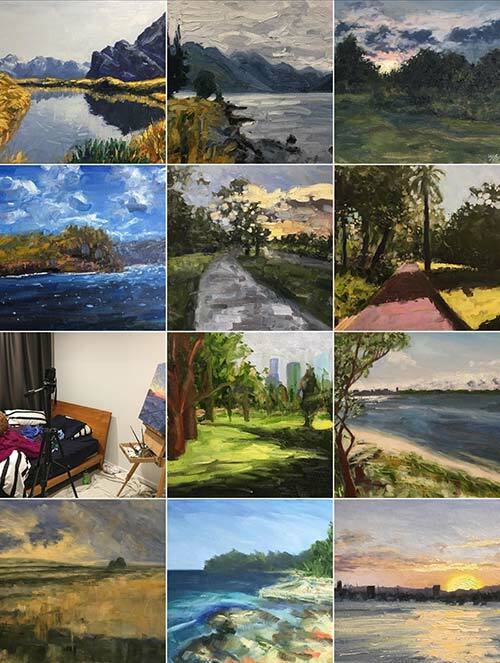 For example, when looking at a group of my recent paintings I noticed they are generally much more saturated (colorful) than a group of my earlier paintings. This is because in my earlier paintings I was using too much white. I was not able to identify this issue from the individual paintings. I find social media can actually be a great way to keep a record of your activity as an artist. It can act as your own storyline which highlights your progression. Unfortunately, nothing comes close to the community of being in an art school. The next best option is voluntary involvement in the art community through competitions, exhibitions, art demonstrations and online forums. If you get actively involved in the art community then you will not feel so disadvantaged from not going to art school. You have good insight and an excellent way of getting your ideas across. Thanks so much….I’ve been painting for 3 years under an experienced painter and really am enjoying art. Yes they are mine 🙂 Thanks for the kind words. Great tips! I’m looking to get back into the art world. I gave up drawing and painting after feeling lost as a self-taught artist. Too many unfinished pieces wasted. Your tip to try painting small quick pieces and stay consistence will definitely help me get back in the groove of things, as i rejoin the art community. Glad to help Kiki! Yes it can be a challenge but just keep at it. You will get better fast. Thanks for the great article… I now feel inspired again to be creative and vow to make time around my hectic full time job to do a little every day. ??‍? Thanks for the advice! A while ago I started writing short stories about animals, and after watching a role-playing group display their art, I decided I wanted to draw my characters as well. Problem was, I kept comparing myself to them and eventually I all but dropped the whole thing. Now I’m feeling a little better, so I’m gonna try and teach myself the basics before anything else. Glad you enjoyed the post Christine! That is great that you are going to start again. If you need anything, let me know. I minored in art in highschool, but we did such variety of projects that we never focused much on painting. I had some exposure to acrylic paint with crafts so figured that was the medium I would try. January 2017 I started painting. I found that challenging myself to start painting once a week was good. As I made time for that I moved on to 3x week. I did small 8 x10 Paintings to be able to finish and stay motivated. My skill level quickly improved with frequent practice. Reading and watching videos about technique helped me work through areas of uncertainty. Your suggestions are ones I’ve used. I’m going to study more of the Masters’ works next. Thanks for your ideas. This is some really good information about art classes. It is good to know that it would be smart to try to copy master painters art. That does seem like a smart thing to do because that is how the old masters learned how to paint. It might be smart to look into taking some art classes if you are struggling with a certain concept. Thanks Dan for a very helpful article. I am biginning to be a self taught painter and started to make big pieces of art with the results l found it difficult to fill up the background of main subject in a satisfactory way. So making small size paintings is a good tip for me .Thank you once again for the very good article. No problem Asha glad you enjoyed it! I recently discovered your page and must say It’s very helpful! Thanks for a newsletter. I really enjoy your articles. I do not feel disadvantaged by never having an art class. I picked up a paint brush for the first time in my life in November 2017. What a life changing moment. I have been blessed by having a lot of friend support on this new adventure. I agree that social media and participating in art events and forums have been helpful. In fact I have developed long distance relationships with professionals who have started giving me tips and directing me to resources ( You were recommended to me by one such person). I am a professional nurse. I would not do well in a formal art school. I am perfectly content to explore this and learn as I go. I do not want to be herded into a rigid form of “right” or “wrong” technique. Thanks for all you do and inspiring others to paint. Really helpful and encouraging artical. Many thanks. I will keep going and put those hours in. I am new at this venture. Just a few months. Your insight is quite helpful. So nice to hear your story Dan, exactly the same with me. What a relief to hear there are others out there as well. The hardest part I find is not allowing jealousy of those who have had an easier route to take over. Cheers and Happy Christmas etc. Thank you so much for the encouragement. I too about 20yrs ago dabbled in a bit of folk art but even when young in school I was always copying the work of different artists and topped my class in art. Pity I didn’t get into it in a serious way, but I guess better late than never, and you have definitely inspired me to do just that. Thank you so much. “You may not achieve everything. In fact, you should certainly not achieve everything you desired. What a great quote, Dan. Everything you have mention in this article, I am experiencing! Thank you so much for sharing this advice with amateur artist! I saved this so I can go back and read and remind myself of these inportant tips, ty!! Hi Dan, I have just started painting after 25 years. I have no quiet place to work and the family room where I’ve been painting is too noisy with the TV on and my husband and his mother talking. What should I do? Just do the work and see what happens…. Hi! Thanks so much for your honest experiences and insight! I”m painting again after 30 years!!!! I appreciate your advice about painting small projects frequently. I’m going to get some small canvases!!!!Recimmemdations…. level 1, 2 or 3, canvases ? senza saperlo avevo già provato ad imparare a dipingere copiando i maestri e facendo dipinti in piccolo formato in acquarello. Dopo aver letto il tuo articolo sono sicura di essere sulla strada giusta perchè in quel modo ho appreso e poi migliorato la mia tecnica. Gli amici mi dicono che i miei dipinti sono belli ma io non ne sono convinta . Dipingo da circa 2 anni e non so ancora quale è il mio “stile”. Come fare a farlo emergere? Se hai un cinsiglio da darmi ti ringrazio davvero tanto. This is insightful information. Thank you. Thanks for your comment. It sounds like the following article on Beginner’s guide to light and shadow for artists might be helpful to you. Hi Dan I’ve bern dabbling in acrylic paintings for a ehile and have tried lots of different ideas to which I’m always proud of but can’t seem to settle on any particular style I can call my own…yet. I love what im doing and have begun enjoying modelling pastes for texture its great. My boss gets all my wirk on his wall and they sell from there. Yet to find my niche. It sounds like the following article on How to Develop Your Own Unique Style will be useful to you. Thanks Maree, hope this helps! Love it, especially number 3. I’m a strong believer that the more you steal, the better. And ironically, the more people you steal from, the more unique your style will be. Thank you for that – it really resonates with me. I went to art college (briefly) then did art at College of Education and neither taught me HOW, they were so busy being in awe of abstract work. Which meant very little to me – I needed the basic skills. Thanks a lot for all the interesting & helpful info you send Dan. It is appreciated very much. Thanks for all your different topics you provide and for sharing helpful information and suggestions!